I’m going to begin with a story: When I was in 7th grade I had delusions of grandeur. I knew that I was a smart kid and thought that I could pretty much read anything. I was probably reading adult books at this time, generally in the sci-fi and fantasy realm. I had already devoured many titles and series that I could mostly understand: The Lord of the Rings* and those that I didn’t totally get: C.S. Lewis’ Space Trilogy. ** That Hideous Strength is a weird, weird book but definitely worth reading. Basically, I thought I was The Smartest. So I decided to try and read David Copperfield. I’m not entirely sure where I got this idea, but I blame that dangerous cocktail of too much PBS and too much “Jeopardy!” I wanted to know everything so I could be on “Jeopardy!” (Life achievement unlocked! Whee!) Dickens’ books always seemed to come up on the show, and I already loved A Christmas Carol, so I figured the story of a young boy trying to sort out his life would be perfect for me. I would learn all the Dickens answers on Jeopardy! and probably find so much in common with young Mr. Copperfield! It would be so enriching! I don’t know if you’ve ever read David Copperfield, but it’s boring. Or at least boring to a 7th grade girl whose only desire in reading it was to be smarter. I hated it. I got halfway through – way to go 12-year-old Anna!- and then realized this was the worst book ever. I didn’t read Dickens for years afterward until I absolutely had to in college when I had to read Hard Times. Hard Times is perhaps not Charlie’s most thrilling work – it’s mostly about the impact of the Industrial Revolution on society – so I assumed all Dickens was stupid and told everyone that. Then I watched the phenomenal BBC mini-series version of Bleak House over Christmas break with one of my college roommates. We would make nachos in her oven, carry the cookie sheet full of melty cheese chips up to her room, and swish together on her squeaky twin bed to watch the DVDs on her laptop. It was amazing! I then read the book and realized it was even more amazing than the miniseries. Dickens had been redeemed. Yes. I felt so much shame about not finishing David Copperfield that I wouldn’t even tell anyone that I tried to read it. I was convinced that once people found out I tried and failed to read it that they’d think of me as a quitter or someone who didn’t like books. I wasn’t either of those things! I just didn’t like David Copperfield. So I let myself get all worked up over the years about being the type of reader others thought I would be. Someone who read really deep, intellectual books and thought deep, intellectual thoughts about them. I reacted to my failure of finishing David Copperfield by forcing myself to read every book I picked up, good or bad, enjoyable or not. I would prove my intelligence to the world by reading all of the books! It was sometimes miserable. I really would like a madeleine right now, wouldn’t you? Then about in college I had a revelation, or maybe an epiphany since I was at a Christian college: there are so many books I want to read in the world that I will probably never read them all. This made me incredibly sad. I’ll never get to all the ones I want. I may want to read all seven volumes of In Search of Lost Time/Remembrance of Things Past but I may not get to it. Even though I once famously remarked that Proust, “went on far too long about a stupid madeleine,” I would still like to read it. 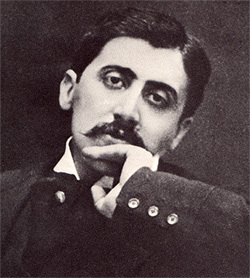 But it’s seven volumes long and in my current job, a knowledge of Proust is perhaps not the highest priority. This depresses me. There are whole hordes of YA books I’ll never get to and classical literature and literary fiction, poetry, science, history, biographies. It goes on. Try as I might, I’ll barely make a dent. So that’s why I decided during that fateful epiphany only to keep reading the books I wanted to keep reading. This leads me to In Sunlight and In Shadow. I loved Winter’s Tale by the same author. It made me want to love New York and believe in magical flying horses, wish for a rooftop bed where I could watch the stars, and dream of ice skating up the frozen Hudson. But In Sunlight and In Shadow stagnated for me. It got diverted from the love story I did care about into this war story that I didn’t. It was taking me weeks and weeks to read because I kept finding other things to read, other entire TV shows worth of Netflix streaming to gorge myself on. I read three or four other books in the meantime. I decided to give it up. Life is too short; my to-read list is too long. And I don’t feel quite as guilty as I did before. There’s too many other things to read. I challenge you to do the same. If you have to read a book either for school or work, then you have to do it. But those precious hours that you get for your own reading should be your own. Take ownership of them! Thanks also for the encouragement from other librarians – GASP! – to just let it go. Thanks, Holly. It was the right decision. What do lovely people think? I am wrong? I am a disgrace to the profession? Let me know! *Fun side note: I remember crying to my mom when Gandalf ‘dies’ in The Fellowship of the Ring and being utterly disconsolate. She wouldn’t tell me what happens later in The Two Towers and when I got to that part I swear my heart grew three sizes. I probably did cartwheels and backflips on my bed, which I’m sure my mom loved. **Fun side note #2: I did an 8th grade book report on Perelandra when all the other students were probably trying to get away with doing reports on some terrible “Animorphs” book or something. My English teacher recently offered to mail it to me. I declined. Probably my favorite blog post yet! I love that mom kept LOTR plot a secret from you. And that you free people to give up on books they don’t totally love. Great advice! What’s your policy on re-reading books? I maintain that “any book worth reading once is worth reading twice,” but sometimes feel guilty about this in the face of so-many-books-so-little-time. In the hours that I’ve spent reading Lord of the Rings eight times, I could have read through several series waiting on my list! Oh I LOVE re-reading! I’ve re-read many a book and think it’s great. There’s nothing like reading a book for the first time, but it’s also great to know what is coming next in the story. I find it very comforting. I wish I remembered all the things I said or did that you kids remember! (Sometimes, I wish I could forget!) This time, it was a good thing. I do remember telling you how absorbed I was in Tess of the D’Urbervilles and when I finished it, went on a rant with my mother about the injustices of the world! Sometimes, when plowing through a book, I come to a point when I say I just don’t care about these people and there are others I think I would care about more. What I keep secret is which books I quit out of fear of judgement because I totally judge people on what books they read and if they like the same ones I do! Tess of the D’Urbervilles has so many injustices it’s overwhelming. 😦 I still love it, though. When were you on Jeopardy and how can I view it? I was on for two shows in January of 2011 (coincidentally, my first day of library school!) I’ll have to see if I can find it somewhere. A friend of mine has it saved on VHS, but that is not a get format…. I hate reading more than one book at once, too! But sometimes I have to for Book Babble and what not. I realize that when I’m reading multiple other books (I call it “cheating” on the original books) that I just need to end it with the first one. Or if I’m watching endless Netflix episodes of something instead of reading, then I probably just need to give up. And it’s ok to still be in recovery. I still feel guilty about it sometimes, too. But it’s a safe space, here. 🙂 Don’t be ashamed!